Samsung Galaxy smartphones are the most popular Android smartphones on the market. They have the highest market share, and in most places, an easily unlockable bootloader. One thing that’s not always easy to come by on Samsung Galaxy phones is the stock Odin flashable firmware that you can flash to either downgrade, upgrade, or restore your phone. Odin firmware files are like the factory images for the Google Pixel, just put into a .tar file and made easy to use via a GUI tool instead of the fastboot command terminal. Download Phone Info Samsung from the Google Play Store. This is to find what your currently active CSC value is. If you already know what it is, skip to step 3. Download SamFirm v0.3.6. 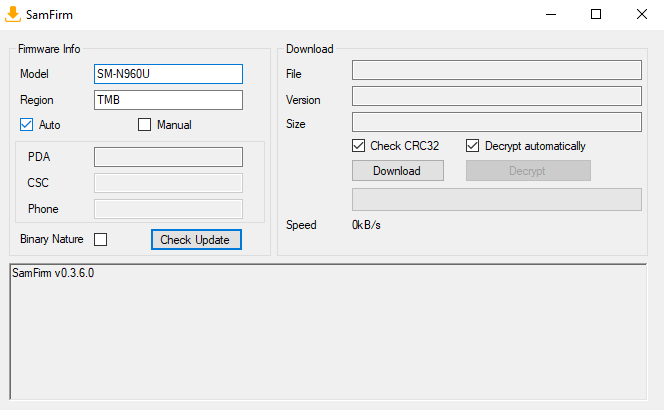 This is the latest build and works for downloading all Samsung Galaxy firmware files. This program does require Windows, as does Odin, so keep that in mind while trying to download these files. Extract and open the zip file you just downloaded. This will contain all the needed files to make SamFirm work. Open SamFirm. Once it’s open, make sure you select the Auto option under the region. This will make downloading files automatic so you don’t need a build number each time to download. Enter your model number where it says Model. This will start with SM-. You need to make sure to include the SM- or it will not download your files. Next, under the region section, enter your three character CSC value from before. Then click Check Update. This will find the latest update for your device. If no update is showing, this could be because the carrier you are using doesn’t use Samsung’s servers for updates and therefore doesn’t store anything where SamFirm can download it. If this is the case, try searching for the firmware of your choice on AndroidFileHost. It will usually be uploaded there. Click Download and select a file location. This will start the download and decryption. This can take a while depending on your network speed and CPU speed. 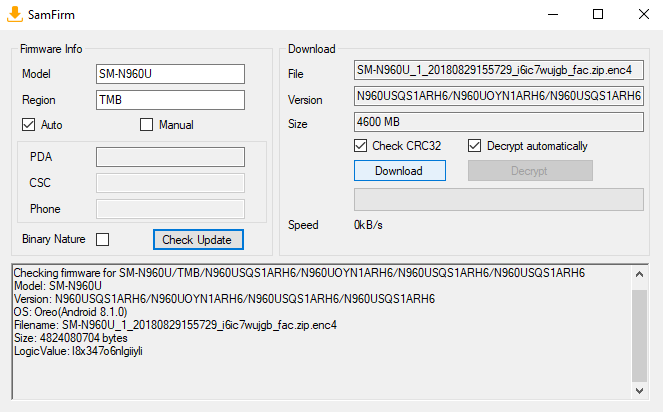 SamFirm will tell you that the decryption has finished in the log window when the file is ready to be extracted and used for flashing. 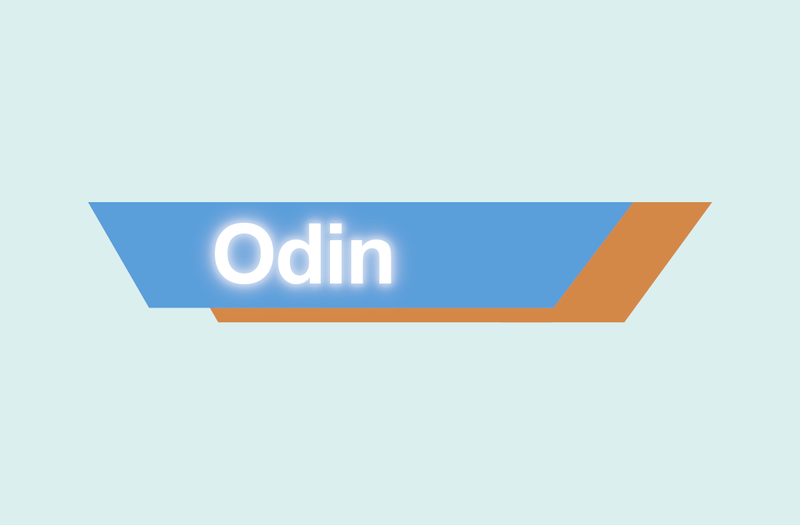 These Odin firmware files are sometimes hard to come by, so its great to see a developer stepping up and making a program to help find what people need.